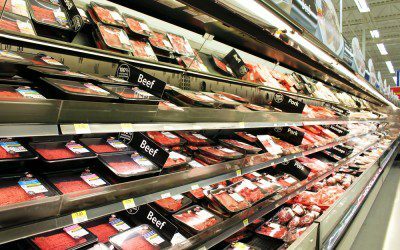 The meat aisle at most grocery stores has become a confusing combination of real meats and products that are posing as such with all manner of different labels. For people with diabetes, there is one thing about this section that beats all others — there are no carbs to account for (although if you really overdo it, too much protein can in fact raise blood sugar)! This doesn’t mean that the meat aisle is a free-for-all or that we should fall into the trap of high-protein fad diets. There are a lot of pros and cons to consuming this type of protein, and it is important to consider factors that may affect your health in other ways, even if you don’t need to take insulin for that rib eye. Before we dive in, it’s also important to note that meat is not essential for a healthy diet. While it has some great nutritional value, you can find those nutrients in other foods, should you choose to eliminate meat from your diet. When it comes down to it, what we eat is often a mix of choice, tastes, necessity, and medical considerations. If it is done short-term and in a healthy and balanced way, a high-protein diet can be good if, for example, you are trying to fit into that dress for your twenty-year high school reunion. However, if you are looking for a long-term solution, a very-high-protein diet is not the best option. When you trade in carbs for foods that are high in protein (and often in saturated fat), your body will be missing key nutrients from important food groups. Stick with something such as the Mediterranean diet, which focuses more on fish and vegetables, and know that how we feel when we are having a low is multiplied by 100 when on an extremely high-protein, low-carb diet (not a great fit for those of us with diabetes). One additional thing to remember is that if you have or have ever had any liver or kidney issues, make sure you talk to your doctor before you attempt to go on a high-protein diet, as the overload of protein can often do more harm than good, especially for those of us with diabetes. And even if you have not had any of these types of issues, always ask your doctor or dietitian first before starting any diet. There is some confusion happening in the nutrition world, especially since the Dietary Guidelines for Americans has recently gone through a reboot. Saturated fat has long been on the enemy list, but there is now a much more laid-back opinion about this nutrient. Why? Science is now saying there is just not enough proof that saturated fat itself is the culprit for many health ailments. This doesn’t give us permission to eat bacon all day every day, though: We should still be aware of the saturated fat content of our foods and aim to keep it below 10% of the calories we eat each day. Regarding what you may have heard about red meat potentially being a cause of cancer, the recent uproar was caused by a statement released by the World Health Organization (WHO) in October 2015, saying that “The consumption of processed meat increases a person’s risk for cancer at a level comparable to smoking… Consumption of red meat also is probably carcinogenic to humans.” The Academy of Nutrition and Dietetics responded, saying, “Consumption of processed meats like ham, bacon, and hot dogs, which are often high in saturated fat and sodium, should be limited.” Essentially, what they are saying is that you should choose lean meats that are fresh and have not been through multiple processing steps to get into their package. Pork and chicken (with the fat trimmed) as well as bison and turkey are good bets. Eat meat in moderation; roughly no more than around three servings per week is ideal (although not always realistic). Try to reduce deli meats, and, if you really want them, to get the low-sodium or organic versions if you can. The term “organic” is strictly regulated by the United States Department of Agriculture (USDA) and carried out by farmers who produce the meat. This basically means that everything from the feed to the living conditions of the animals are taken into account. According to the USDA, meats may be labeled as “natural” as long as they are minimally processed and have no added color or artificial ingredients. Meat labeled “no antibiotics” means the animals were never given these medicines. However, there is no inspection process to verify the claims of “Natural” or “No Antibiotics” food labels. If you want to ensure you get antibiotic-free meat, going organic is your best bet. The price will be higher, but if you like that peace of mind, then go for it. Which protein has more nutrition per pound? Some other factors that are important to consider when selecting meats are the immense amounts of sodium that are found in prepackaged, marinated meats. While these are easy for the busy cook to throw on the grill, beware of all that extra salt. Do your best to get fresh meat and marinate it yourself using such things as garlic powder, mustard, low-sodium soy sauce, lemon juice, etc. Lean meats like skinless, boneless chicken breast; lean, ground grass-fed beef; trim boneless pork chops; and trendier options like bison have high-quality protein and are lower in overall fat and calories than some of the other options. Finally, it’s OK to include a “meatless” Monday in your family meal planning and to go with whole grains and veggies or maybe even try a tofu dish to mix things up a bit. And if you are a full-fledged vegetarian, make sure you are working with a dietitian to assure you’re getting all the required nutrition you need, especially protein and iron, through other sources. Next week, we’ll take a deep dive into fish: the good, the bad, and the scaly.